Once upon a time, there was a man with no neck. Due to the fact that he was neckless, this man was unable to swivel his head in any direction, which forced him to stare straight ahead at dull inanimate objects for lengthy periods of time. To make matters worse, he was also a blockhead. We’re talking a total organization man who played by the book, never wavering from the middle of the road. After seconds, minutes, hours, days, weeks, months, years and decades of living life as a total square, the Neckless One, as he came to be known, finally fixed his gaze upon the exact center of the universe, which is contained in a singularity ensconced deep within the forehead of a 1/24th scale marble / polystyrene laminated statue of the original all-seeing, all-knowing, all-creating consciousness. At that moment, the Neckless One’s bleak existence was shattered wide open by the appearance in his head of deep saurkraut-infused improvised space rock jams that were looser than water flowing down a craggy creakbed. The source of this wellspring was an entity with a similar name as the Neckless One; they were known around town (and throughout the Milky Way) as the No Neck Blues Band. 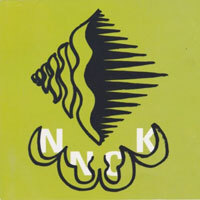 Formed in 1992 in Harlem, New York, NNCK, as the seven-member ensemble is also known, originally took cues from such free-form improv outfits as AMM, Limbus 3 and A Handful of Dust, then went on to combine them with folk, psych and free jazz elements to spontaneously flow out the nine pieces on the CD in question (shown above), Intonomancy. Give it a whirl at your earliest convenience. Your head will be glad you did–even if it’s not supported by a neck. You are currently browsing the Arcane Candy weblog archives for July, 2014.